To create this very special version of red chicken curry, we start by oven broiling chicken thighs under high heat until they are brown and crispy, then simmer them slowly in a sweet and flavorful red curry and coconut sauce. 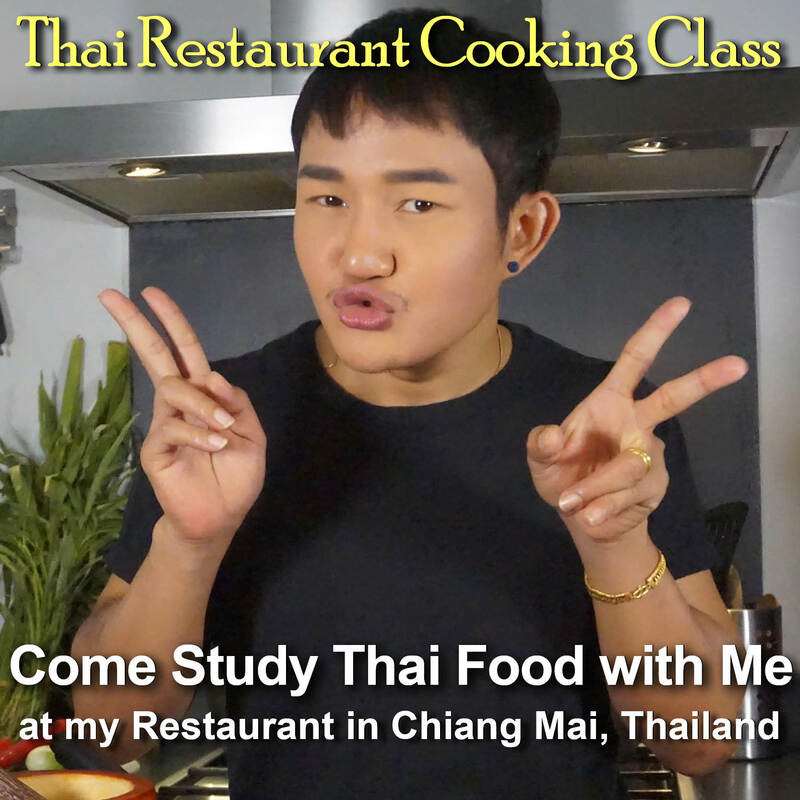 The crispy chicken skin absorbs the delicious, strong red curry spices as the chicken meat finishes cooking, melting rich and fatty juices out into the sauce. 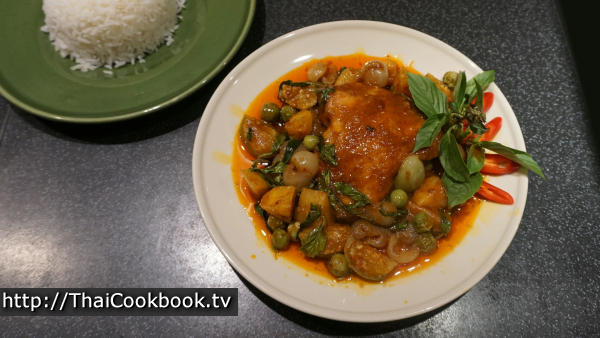 Near the end, we add fresh Longan fruit, pineapple, eggplant, and a healthy portion of Thai sweet basil. Longan, known as Lum Yai in Thai, is a prized fruit grown in northern Thailand. It has a firm translucent flesh, and a flavor that is lightly sweet and citrus. 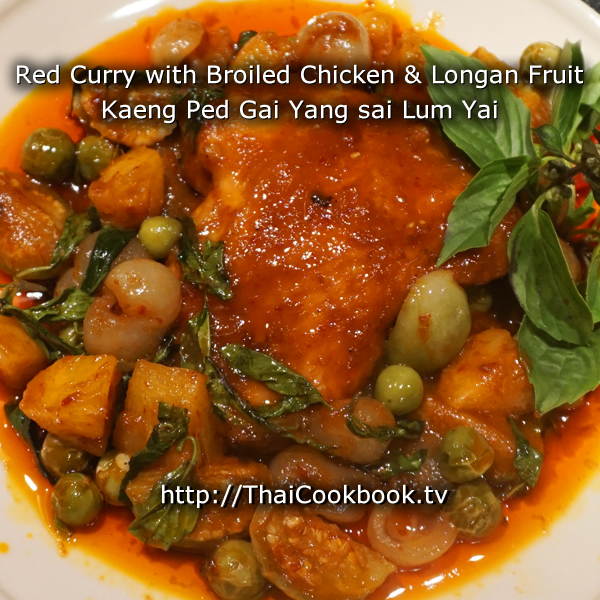 What's in our Roasted Chicken Curry with Longan Fruit. 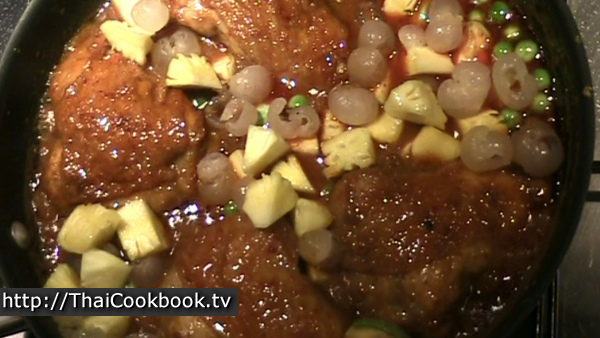 How we make our Roasted Chicken Curry with Longan Fruit. 1) Marinate the chicken thighs in soy sauce for 15 minutes, then broil them on high heat for about 10 minutes or until brown and crispy. 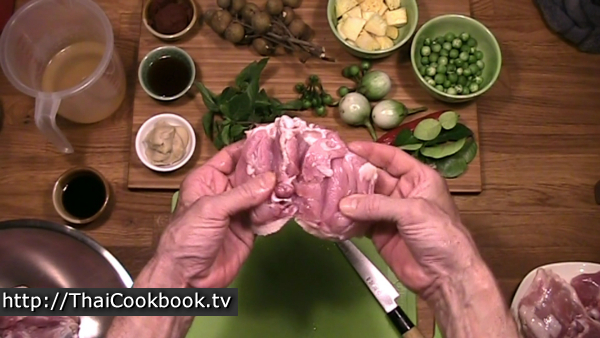 2) Blend the curry paste with coconut milk, sugar, and chicken stock. 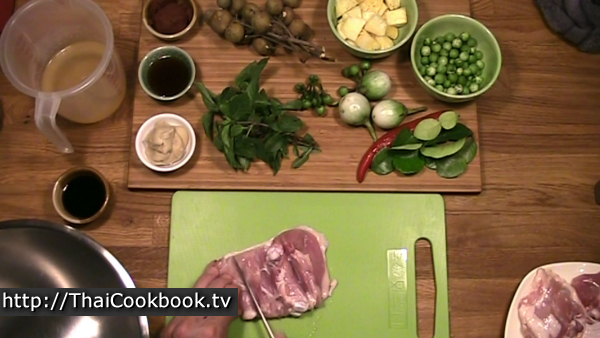 Simmer the chicken pieces and kaffir lime leaves in the curry mixture for about 30 minutes. 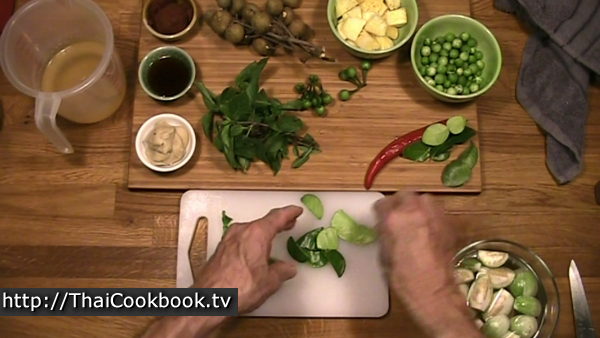 3) Add pea eggplants, Thai eggplant, pineapple, and Longan fruit. 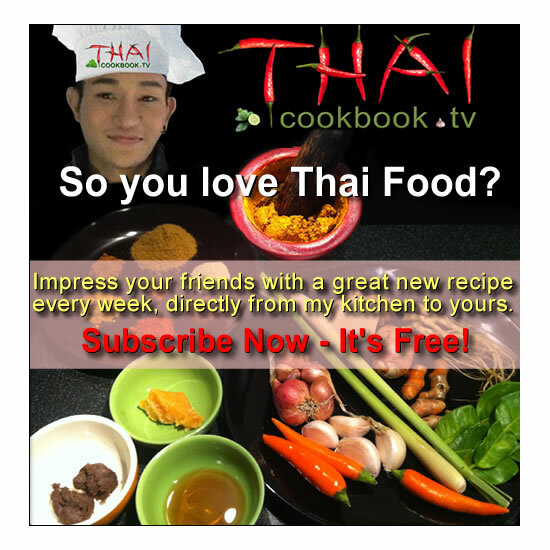 Cook for 5 minutes more, then serve with steamed rice. The ingredient that makes the taste of this curry stand out from others is the fruit known as Longan, or Lum Yai. The fresh fruit is available in the late part of our rainy season here in Chiang Mai, but you can get it canned and that works well for cooking. Just drain the canned fruit and rinse away the sugar syrup that they usually put it in. Use 4 large chicken thigh portions with the skin attached. Slice the inside of the meat along both sides of the bone and in a couple of place on the side, about half way through to flatten out the meat. Cutting it this way will allow the curry seasonings to really get inside the meat, and it will cook faster. 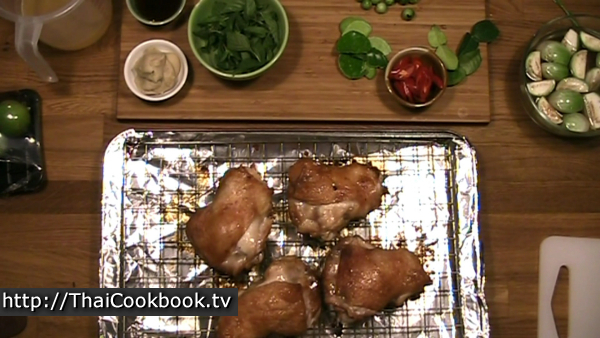 Marinate the chicken in about 2 tablespoon of Thai light soy sauce for about 15 minutes. 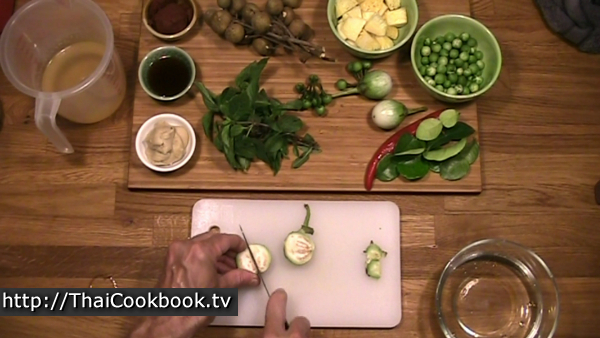 Cut the Thai eggplants into quarters, then place the pieces in a small bowl of water with about 1 teaspoon of salt. The salt water will keep them from turning brown. Tear the kaffir lime leaves and remove the center stems. Slice the red chili on a diagonal line so they look nice. Cut the pineapple into small bite-sized pieces. 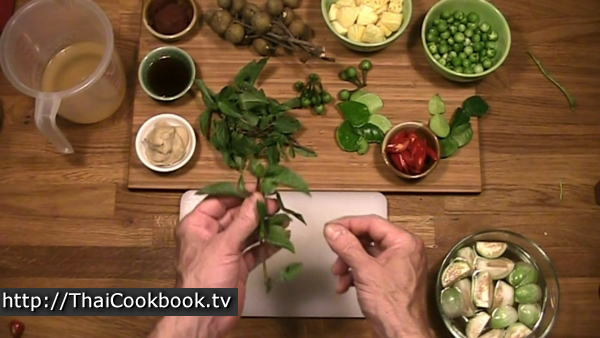 Clean and pluck the stems from the pea eggplants, and pluck the leaves and flower tops from the Thai sweet basil. Peel the hard leathery shell from the Longan fruit. Use a knife to cut all the way around the fruit in the direction of the seed, then peel it apart and remove the seed. You can also use a cherry pitter to remove the seeds easily, after removing the outer shell. 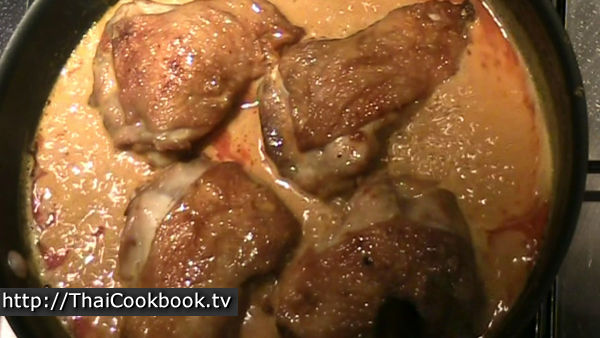 Place the chicken thigh skins side up on a baking sheet with a wire rack. Broil in an oven broiler for about 15 - 20 minutes at 450° F or about 230° C, or until they are golden brown and crispy. 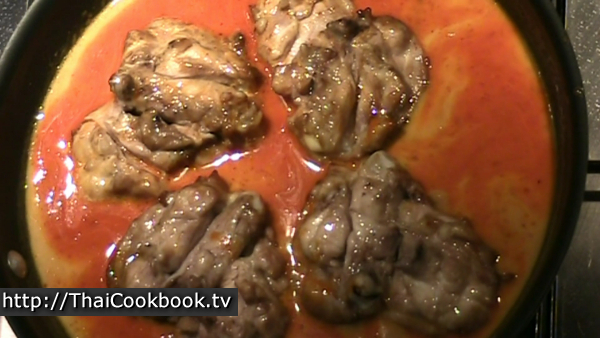 It is not necessary to fully cook the chicken, as it will be cooked for a long time in the curry. Remove from your oven and set aside while you prepare the curry. 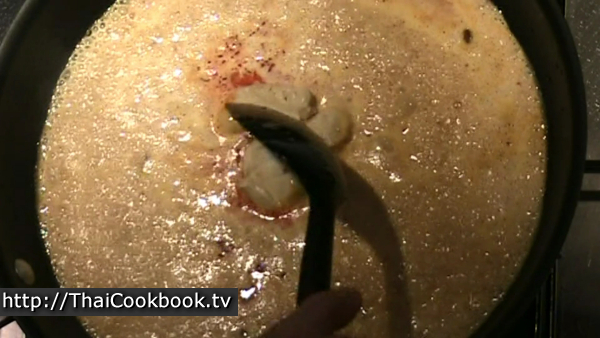 Add 1 tablespoon of oil to a large frying pan with a lid. Turn the flame on low and add the curry paste. Push it into the oil and let it start frying. After it warms up it will start to even out and get smooth. 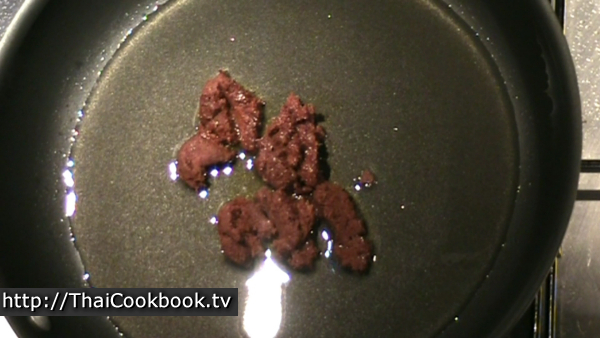 Keep stirring, and fry in the oil for about 2 minutes. When the curry is smooth, oily, and bubbling, add the coconut milk. Stir it in well and bring to a slow boil for about 5 minutes. Add the coconut sugar to the curry and coconut. Keep stirring until it dissolves completely. 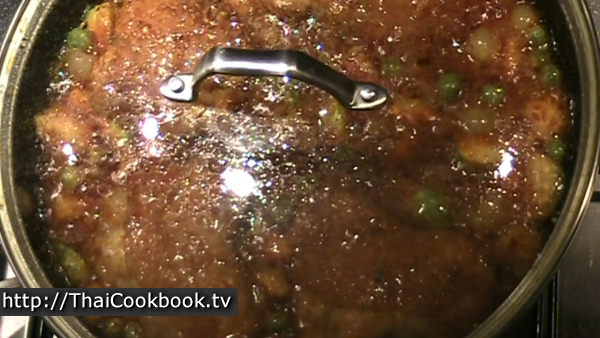 Add the chicken stock to the curry mixture and stir it in well. 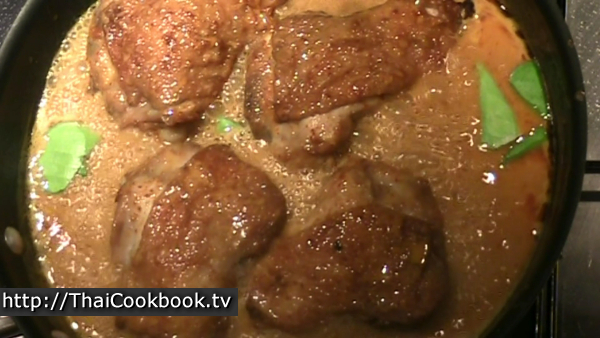 Lay the broiled chicken thighs into the curry, skin side down, and let it come to a boil over medium heat. The secret to making this come out nice is to keep the browned chicken skin in place, so just cook it for a minute so it has time to absorb some of the spices, but not soften up too much. Now turn the chicken pieces over so the skin side is up, and cook at a nice boil with the lid off for about 5 minutes. Next add the kaffir lime pieces and stir them in well. Baste the chicken with the sauce about every 5 minutes, and continue cooking for about 20 minutes. During this time the sauce will thicken and be reduced by about half. If it gets too low you can add a little water, but you want the sauce to be like thick gravy when done, so just a little. At this point we usually season the curry with fish sauce. Taste it first to see if it is salty enough already. Some prepared curry pastes are quite salty, so you may not want to add more salty fish sauce. If needed, just add a little at a time and keep tasting the results. 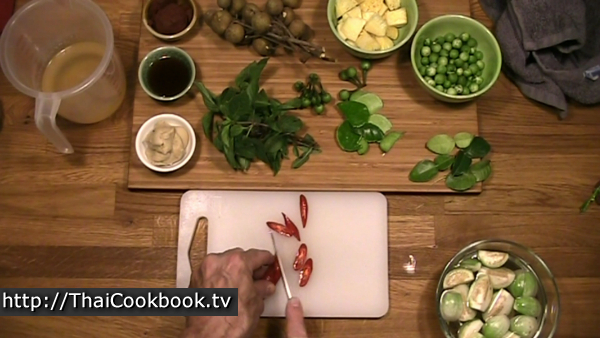 Add the Thai eggplant, pea eggplant, pineapple and Longan fruit. Stir it all into the sauce carefully until well coated. Cover with a lid and cook for about 5 minutes. Turn off the heat and add the basil, just stirring into the curry lightly until it gets wilted. Let the curry sit and cool for about 10 minutes, then serve one piece of chicken with plenty of sauce and fruit on a small plate for each serving, or put everything on a platter to serve at the table for a family style meal. Arrange the pieces of fruit, eggplant, and basil around the chicken so it looks pretty, then garnish with some sliced red pepper and fresh basil tops. Serve with steamed rice.